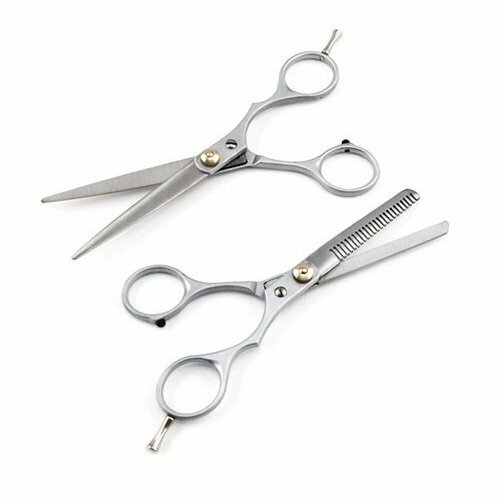 This SODIAL set includes pair of hair cutting and thinning shears which are made of stainless steel on handle part and zinc alloy on part of blades. Hair cutting shears have convex hollow ground blades, but hair thinning scissors have one blade with 24 micro-teeth and one blade with razor edge. Both cutting and thinning shears are 6 inches long. Both of these SODIAL shears have screw for tension adjustment, therefore, every hairdresser can adjust the tension for their individual needs. They also have removable finger rest for better comfort, but in cases when it seems disturbing it can be removed. None of them has rubber inserts for finger holes which usually help to adjust the size of holes and increase the comfort, therefore, if their original holes without any inserts are not suitable for fingers, they may be unstable and uncomfortable to use. These SODIAL hairdressing shears come with black synthetic leather storage case, therefore, they are safe and comfortable to move. Both hair cutting and hair thinning shears are silver color with slight polish for sheen. Their screws and finger rests are gold plated, so their warm color contrasts with cool color of silver. They have stylish curvature on one side of handle. SODIAL cutting shears are meant for hair cutting, practicing different techniques of hair cutting, but thinning shears are meant for hair thinning to reduce the volume of hair. This shears set can be used by professional barbers and by hairdressing students, because they have all of necessary qualities and their price is affordable as well. These SODIAL hair cutting and hair thinning shears are made of stainless steel (handle) and zinc alloy (blades). Hair cutting shears have convex hollow ground blades, but hair thinning scissors have micro-teeth and razor edge blades. Needless to say, that both of these blades are very sharp, so they are suitable for various hair cutting techniques and hair types. Both of these barber shears are 6 inches long and their total weight is 5.6 ounces. As they are made of steel, they are silver color with gold plated elements such as screw for tension adjustment and removable finger rest for hairdresser’s comfort. Unfortunately, they have no rubber inserts for finger holes, therefore, they may be unstable and uncomfortable to use. Both of these SODIAL scissors come with synthetic leather storage case, so they are comfortable and safe to move. 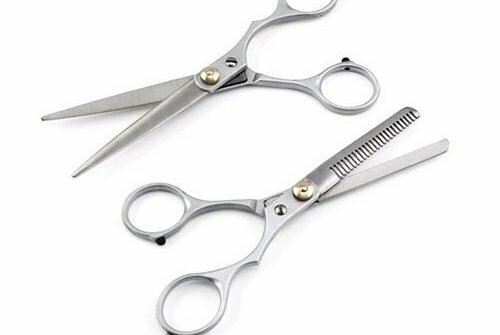 These cutting and thinning shears are suitable for professional and amateurish use, so they can be used in barbershops, salons, schools and households.